Our passion is to build beautiful, functional stairs that become a statement for your home or project. No job is too big or too small - we are the stair specialists. For over 15 years, we have been designing and building stairs and staircases that add style, form and function to homes, offices, retail spaces and large commercial buildings. Our philosophy is that if it's stairs, we can build them with passion, beauty and quality that lasts a lifetime. 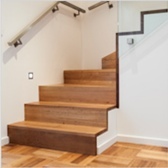 When it comes to the staircase for your home or project, we will take your ideas, dreams or plans and transform them into a sleek and exciting addition that reflects your personal taste and needs. We work with you through every step of the process to ensure that your design fits your space, style and lifestyle. Then, we will take care of every step from design and sourcing materials through to production and installation. Your stairs need to reflect the life you live, so your first step is to get inspired about the materials, design style and features that are available. You can start with talking to us - or why not create your own inspiration board to get the conversation going? Use our selection guide to explore the range of materials, styles and features available and to see photos of how others have created their own dream staircase. Take the first step and get started today! Justin Tilley is proud to lead the highly qualified and dedicated Just Stairs team at his factory in Newhaven on Phillip Island. Justin has over a decade and a half of experience in designing and building stairs for clients ranging from a small domestic outdoor stair through to stunning architectural additions to homes and large-scale commercial projects. If it’s stairs, we can design and build it. And, we take pride in our attention to quality and detail. We listen to you to ensure our clients are 100% happy, 100% of the time. We look forward to talking to you about your project soon, no matter how big or how small.